Safe Sitter® prepares students in grades 6-8 to be safe when they’re home alone, watching younger siblings, or babysitting. Students learn life-saving skills such as how to rescue someone who’s choking, and helpful information like what to do if there’s severe weather. The lessons are filled with fun activities and role-playing exercises. Students even get to use CPR manikins to practice choking rescue and CPR! Life & Business Skills: The ability to screen jobs, discuss fees, and greet employers will set students up for success now and in the future. Students practice these skills through various role play. The classes are designed to prepare students in grades 6-8 to be safe when they’re home alone, watching younger siblings, or babysitting. The Instructor-led class is filled with fun games and role-playing exercises. Students even get to use manikins to practice rescue skills like choking rescue and CPR! For more information, Contact us Today! 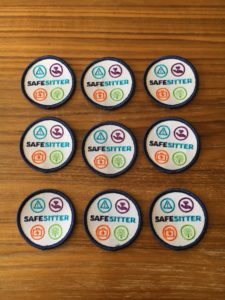 Completing Safe Sitter® Essentials, Safe Sitter® Essentials with CPR, or Safe Sitter® Expanded meets some of the requirements of the Cadette Babysitter Badge and Cadette First Aid Badge.